Home cholesterol test kits enable you to check your cholesterol readings hassle-free and from the comfort of your own home. Cholesterol is a fat-like substance which can be found in every cell of the body. Our body needs cholesterol for vitamin D, making hormones, and digesting food. Luckily, our body makes the cholesterol we need (Source). These kits offer accurate cholesterol health screening results, without the need for waiting at the clinic or hospital. Most of them are convenient and highly reliable. Another advantage of buying a home cholesterol test kit involves doing away with the trouble of visiting a medical lab for blood work specimens. It takes a long time to get the results, as you probably know! Getting your cholesterol readings at home makes it possible to have the results available immediately. The First Check Home Cholesterol Test provides data on your overall cholesterol level in around 10 minutes. High cholesterol is one of the major risk factors for Coronary Heart Disease, which causes the highest number of deaths in the USA today. Our top choice, First Check, offers accurate, quick, and reliable cholesterol test results in the comfort of one’s home. When used as instructed, the kit provides an accurate early warning feature. To explain, there is a clear four-step instruction sheet that explains how to use the test for optimal results. User-friendliness is the top feature of this product. Also, it is very fast – it takes only a few minutes to get the results. Ultimately, this is one of the most complete home test kits available today. A lot of doctors admit using this kit to detect high cholesterol in the absence of access to a hospital. This device is second to none when it comes to quick testing features and educating users about the dangers of high cholesterol. A word of warning – do not take any product containing acetaminophen (most OTC painkillers contain it) or more than 500 mg of Vitamin C 24 or fewer hours before testing. Knowing your cholesterol level enables you to take control in preventing heart disease. This is a full kit, with which you can measure your cholesterol. You don’t need anything apart from the gracious, user-friendly instructions. In addition, this device is equipped with a high-tech test strip vials to draw blood from your finger for a sample. These test strips are simple to use. A number of online testimonials also point to user-friendliness in following detailed steps for fast and accurate results. This device is a bit more expensive than most other cholesterol home tests. However, if you’re unsure how to use the product, you can call a toll-free helpline. Many customers are happy with the service they receive at this line. In general, CholesCheck is of great assistance to anyone who wants to keep risk factors for coronary heart disease under control. 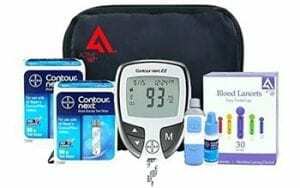 The product’s complete package approach targets users who are very serious about getting a correct cholesterol reading. This is a hallmark home testing kit to check cholesterol readings in neutral, borderline and dangerous ranges. The testing kit includes a cholesterol test device, lancets to draw blood, result charts, gauze pads and bandages. Cardio Chek also offers a toll-free helpline and detailed information on how best to use this highly precise tool. Truly, customers appreciate the product’s three-step instructions and swear by it. The test kit offers the most reliable home cholesterol measurement of any comparable device in this price range. The company provides informative, educational data both inside and outside the packaging about how to reduce cholesterol levels and doctors are also very pleased with the product and believe it offers valuable tips on how to control cholesterol and why high cholesterol is a health risk. First and foremost, safety information should be a concern. Users should make sure that they apply a blood droplet of the right size on the test strip. Keep in mind that test strips do have expiration dates. To get your reading, insert the memo chip into CardioChek. You get a unique chip with every set of test strips. Then, apply your blood to the strip, insert the test strip into the device, and wait for the results. Users rate the EasyLife Hemoglobin total cholesterol test kit as very easy to use, highly accurate, and extremely fast. A lot of people say readings are ready in around 10 minutes after they have drawn blood from their fingertip to the well of the product. A number of health organizations vouch for this product, rating it as very accurate. Home cholesterol testing has never been easier. The kit is also shipped quickly when ordering online at major health product sites. EasyLife is a complete cholesterol testing product that is said to have never let a customer down. Results are always fast and correct. On the downside, this high-tech home cholesterol test meter is a bit pricey, but the accurate readings more than makeup for this. All in all, you can monitor your cholesterol successfully at home with this device. The package includes a quick reference guide, a user-friendly manual, a specialized carrying case, a warranty card, and batteries. It is rated as useful and safe for diagnostic use when determining cholesterol and glucose. While the device is designed for ease of use and quick results in mere minutes, there are many users who praise the producer for their friendly, helpful customer support and free technical advice and assistance that is available 24 hours a day, 7 days a week. EasyLife is a true hallmark product for measuring total cholesterol. It is an excellent indicator and early warning tool for cardiovascular heart disease. Our fifth choice, the Cholestrak Total Cholesterol Home Testing Kit, is on par with the highest standards for home testing kits to measure cholesterol readings in all possible ranges. The testing kit is shipped with a cholesterol test device, result charts, lancets, gauze pads and bandages. With this test, you will know what your cholesterol levels are like in 15 minutes. Enclosed you will find a brochure with the national cholesterol education program guidelines. The user-friendly kit includes 2 single-use tests. Please be warned that hemophiliacs or people taking blood thinners should not use this product. Everyone should take the time to read all label information on delivery. The company offers a toll-free helpline for anyone who has any concerns with the product whatsoever. The product’s simple instructions are appreciated by users, many of whom find this home testing kit to be the best on the market. This test kit offers the most accurate home cholesterol measurement of most other similarly priced products while also offering a wealth of educational data. 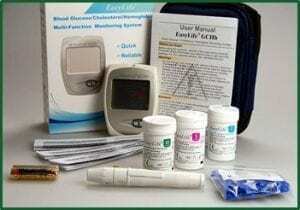 This full home blood cholesterol testing package has all you need to check your cholesterol. This is the type of home kit that is always there for customers who are concerned with their cholesterol. It is a top rated kit designed with careful attention to detail, which is easy to use. The first thing you should look for is FDA regulation. The home cholesterol test kit of your choice should be regulated. There are home test kits on the market for triglycerides and HDL cholesterol too, but not all of them fulfill the strict requirements of the US Food and Drug Administration. If you don’t know which of the cholesterol home tests above to purchase or what to buy in general, you can check out the FDA’s Over-The-Counter Database. It is accessible on the FDA’s web site. This database is an excellent source of information if you’re interested in FDA-cleared cholesterol home test kits. It can also be used to find other types of home test kits. It’s strange, but it has happened – a lot of people hear about bad and good cholesterol, high and low levels, etc. and know this is important, so they buy a home cholesterol test kit. But they don’t read the results correctly, because they don’t know how! So what do those numbers really mean? If your cholesterol is 200 or less, you’re within normal range. High cholesterol is 240 or higher, and everything in between is borderline. Obviously, the values of children should be lower than those of adults. If a child’s total cholesterol is 170 or less, the child is safe. 200 or more is high, and borderline is 170-199 respectively. All other data is carefully explained in the instructions that come with all the products reviewed here. Don’t forget to check the expiration dates before you purchase a cholesterol test kit, even if it comes highly recommended and is costly. If you use the kit past this date, it will be useless. Check several reviews to find out more about the accuracy of results before choosing a specific kit. However, we do vouch for the five on here. Having said that, there are some exceptions. Even the best product is bound to have at least one unsatisfied user. The sheer choice of kits on the market makes it hard to settle on a particular one. To establish quality, begin with well-known brands because they are less likely to risk selling an item of inferior quality. A product with a warranty or a solid return policy gives more weight to its quality because this is the producer’s way of showing confidence in the kit’s performance. One should also take reliability into account before choosing a given cholesterol test product. These devices can vary greatly, with some giving fluctuating results. Others will show consistently low and inaccurate cholesterol values. Most kits are around 95% accurate. Even with the most accurate and reliable kit, these tests should not fully replace tests conducted by health care providers. Doctors evaluate the cholesterol level together with a physical exam and weight before determining if you face a risk of coronary heart disease. Most customers give the price top priority when deciding on what product to buy. We can’t say it is not important, but it should not be the only consideration. Usually, more expensive products offer higher quality and are more reliable. Newmarket entries are often cheap, yet of excellent quality. At any rate, we recommend staying away from very inexpensive, low-end options. Home test kits are small and compact. They can be used anywhere, at any time. This is an important feature if you travel or are on the go often. If you only need to use the kit at home, this feature may not be significant with a view to your purposes. Home cholesterol test kits are very useful for people who do not want to waste time visiting a doctor every time they want their cholesterol levels checked. This is expensive and unnecessary. These kits are simple to use and generally deliver accurate results. 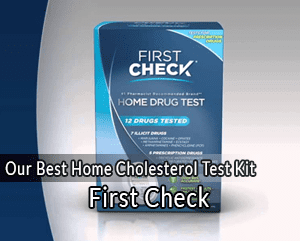 We hope you enjoyed our list of the 5 best home cholesterol test kits. Each of the products reviewed here will suit your health needs. We wish you luck – share your experience here with us in the comments section down below.